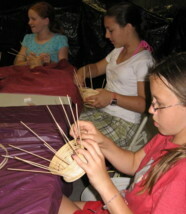 Campers choose 3 skill-building activities to participate in each day. The listing below represents a sampling of the activities that may be offered during the season. There may be additional activities available depending on staff availability. Note: An additional activity fee required. Register early, spaces are limited. Available for campers finishing 3rd grade and up. Learn important safety rules and how to ride and care for horses in Horse Sense. After passing Horse Sense, campers review the safety rules and work on improving their riding skills in Intermediate Horsemanship. After successfully passing both levels, campers spend the bulk of the time riding trails in Trail Riding! **Campers must successfully pass a written test and riding test before they can complete Horse Sense or Intermediate Horsemanship. Campers typically spend at least 2 summers at each level. New campers with previous riding are initially placed in Horse Sense until our staff is able to assess their safety knowledge and riding skills. Helmets are provided. Campers MUST bring hard-soled shoes (preferably boots) and long pants to be able to participate in this activity. Air Rifles: Learn proper techniques for accurate, safe air rifle shooting while laying, sitting and standing. Available to grades 5 and up. .22 Rifles: Learn proper techniques for accurate, safe .22 rifle shooting. Available to grades 5 and up. Archery: Go for the bull’s-eye! Learn proper techniques for accurate, safe shooting. Two skill levels offered; Yeoman badge required for Advanced level. Available for grades 5 and up. 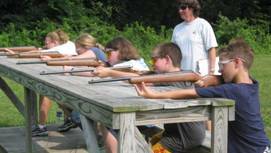 Intro to Target Sports: Introduction to both air rifles and archery specifically for grades 3 & 4. Swimming Lessons: Spend some time at the pool! Learn to swim or improve your strokes according to CCPA swim levels. Fishing: Sometimes they take the bait: hook, line, and sinker! Help us reel in the “catch of the day.” Bring your own pole or use one of ours. Water Play – explore what water does, what it feels likes, how it reacts when mixed with other items, and get to play “drip drip drench” when it’s hot! OLS- Take a hike, learn to tie knots and identify harmful plants. Build a campfire and learn how to safely use a pocketknife. 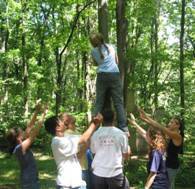 Have fun as you learn beginning skills of how to survive in and enjoy the great outdoors. *Note: Campers will need 1 pair of long pants and a water bottle for the hike. Nature Expedition: Find out what lives in and around Cedarbrook Camp in the woods, pond and creek. Expand your understanding of God’s creation as you explore, sample, and identify the interesting flora and fauna. You might go on a hike, explore in the creek or look for critters, creatures and bugs! Challenge Course: Challenge your body and mind as you work with your team to solve problems creatively. – Note: Long pants and a water bottle are required for this activity. Samurai for Christ: It’s a matter of honor! Dabble in four types of self-defense, calligraphy and sumo wrestling. Sports & Games: Have fun, learn teamwork, and develop new skills, all while playing different sports and games. Drama: Lights, Camera, Action! Younger campers learn miming and perform a play for the camp using scenery, props, and costumes. Older campers spend time understanding acting, formal and improvised, and then learn a drama to perform for the camp. Make a Joyful Noise: Have fun exploring music! Sing, make simple instruments and play musical games. Sign Language: Discover a new way of sharing and communicating with your friends. Learn to “speak” and sing the good news of Christ’s love by signing. Arts & Crafts: Learn new techniques and create different crafts to take home. Two levels offered based on age. Newspaper: Ever had the desire to snoop around? Now you can do it for a purpose. Create poems, articles, and conduct interviews for the big publication. Ukrainian Eggs: Learn the techniques and create these delicate, beautifully dyed eggshells. Woodworking: Create your own project to take home while learning to use a hammer, saw and other tools safely. Rocketry: Build and launch your own rocket! Surprise: Too many great choices to decide? Try something new and exciting each day!